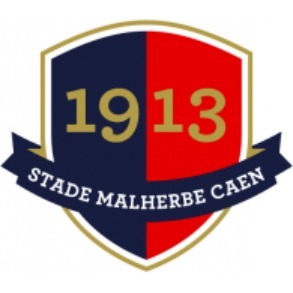 Caen Stade Malherbe de Caen is a French football team, playing in the city of Caen, Normandy. The team is named after François de Malherbe (1555-1628), a poet, critic and translator, who was a native of Caen. tade Malherbe de Caen is a French football team, playing in the city of Caen, Normandy. The team is named after François de Malherbe (1555-1628), a poet, critic and translator, who was a native of Caen. In the 2003/2004 season, Caen finished 2nd in Ligue 2, gaining promotion to Ligue 1. They were relegated on the last day of the 2004/05 Ligue 1 season, finishing in 18th place despite some positive results, including a surprise 3-2 away win at Marseille. But the main highlight of their season was making it into the final of the Coupe de la Ligue for the first time in their history. Their chance at a major trophy eluded them however, as they lost 2-1 to Strasbourg in the final. On 25 May 2007, SM Caen obtained promotion to Ligue 1 after a victory in last game at Libourne (1-2). In the 2008/2009 season, the team was once again relegated to Ligue 2 after losing 1-0 at home to Bordeaux.